Aim: To evaluate pre- and postoperative hearing status in patients of chronic suppurative otitis media (CSOM) undergoing mastoidectomy with tympanoplasty. Study type- Prospective. Materials and Methods: Eighty cases of CSOM were included. All patients underwent a pre-operative pure-tone audiometry (PTA) to find out the hearing status and to obtain documentary evidence for the same, and X-ray mastoid (bilateral Schullre's view) to assess the pathology and surgical anatomy of the mastoid. All patients included in the study were categorized into three groups according to the surgery planned: Group-A: Tympanoplasty, Group-B: Canal wall up (CWU) mastoidectomy with tympanoplasty, and Group-C: Canal wall down CWD mastoidectomy with reconstruction. Post-operatively, after 10 weeks and 6 months, audiological examination (PTA) was carried out to compare pre- and post-operative hearing status. Results: In this study we found that postoperative hearing results were better in the case of safe CSOM as compared with unsafe CSOM and of tympanoplasty as compared with tympanoplasty with mastoidectomy. Aim: To study speech disorders encountered in routine ENT practice and the role of speech therapy in its effective management. Material and Methods: The present study was carried out on 60 patients, who were presented to the out patient department of E.N.T., M.P.SHAH MEDICAL COLEGE, JAMNAGAR (Gujarat),for speech disorders. The OPD and Indoor patients of the E.N.T. department, who had a speech defect prior to or following surgical interference for organic Otorhinolaryngologic disorders were also included in this study. Results: Speech disorders like Dyslalia, Dysglossia, Stuttering were prevalent in both the sexes and in every level of society, though the disorders were more prevalent in males as compared to females. Stuttering was the most common disorder encountered and speech therapy had encouraging results. All the ten patients of Dyslalia were subjected to appropriate articulation training, following which eight patients improved satisfactorily whereas two patients missed follow-up. All the eight Deaf-Mute patients were given auditory training and speech and language stimulation therapy, following which, two patients acquired satisfactory speech level. All seven patients of Dysglossia improved satisfactorily after tongue tie release surgery and appropriate speech therapy. Conclusion: With the advent of newer treatment modalities and improved coordination between ENT surgeons and speech-pathologists for correct diagnosis of speech disorders, speech therapy is suitably individualized according to the expectation of the patients and limitation of the speech pathologists. A fuller understanding of the effectiveness of speech therapy amongst the patients has developed and it has emerged as an acceptable modality of treatment of various speech disorders. Introduction: Gresham's law says "bad money drives out bad money out of circulation". Need for the study: In context of audiological practice Gresham's law would state that with advent of more recent and costlier versions of test procedures and management options for the hearing loss, the older and cheaper ones would be replaced. This is not desirable in a developing country like India. Aim of the study: Gresham's Law says "Bad money drives out the good money out of circulation". 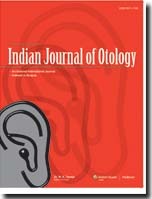 The aim of the study was to study the current trend practised by the audiologists in India and to examine whether Gresham's law is manifesting in the same. Methods: Two groups were taken. Group A (N1 = 42) consisted of practising audiologists, and group B (N2 = 26) consisted of audiologists in academic staff position. The survey questionnaire consisted of questions about the audiological practices with ten point Lickerts scale. Results: Essentiality of certain newer versions of assessment and management were rated higher by practicing audiologists than staff heads and professionals in academic field. Conclusion: The study revealed the rising trend amongst audiologists to use more updated versions in the assessment as well as intervention as against use of older, low cost versions of assessment and management options suggesting manifestation of Gresham's Law in audiological practice. Implication: The working audiologists should be cautious against following the protocol blindly and they should apply their acumen using readily available equipments and not rely heavily only on latest equipments especially in developing country like India. Background: Present study aimed to see effect of number of stimuli on auditory reaction time. Reaction is purposeful voluntary response to different stimuli as auditory stimuli. Auditory reaction time is time required to response to auditory stimuli. Materials and Methods: The auditory reaction time was measured by the reaction time instrument in subjects. Simple reaction time and choice reaction time measured. During the reaction time testing, auditory stimuli were given for three times and minimum reaction time was taken as the final reaction time for that sensory modality of that subject. The results were statistically analyzed and were recorded as mean ± standard deviation and Student's paired t-test was applied to check the level of significance. Results and Conclusion: The study shows that simple auditory reaction time is less than choice auditory reaction time. Mental processes are involved in identification of stimulus, response selection, and programming and this takes certain time. Response to stimuli would be faster if number of stimuli is lesser in number. In routine life, many works done on information of auditory stimuli. Person should be careful while driving in talking with others or in mobiles. Training reduces reaction time. In medical examination, there are identification of instruments, graphs, bones, and viva questions as well. Student can practice and decrease mental processing time for identification of all this and can respond quickly. Purpose: To assess the characteristics of hearing loss with respect to tinnitus and to study the efficacy of various modalities of treatment of tinnitus. Design: Prospective study. Materials and Methods: Patients were assigned into three groups. All patients underwent a complete ENT examination, followed by pure tone audiometry, tinnitus matching, and tinnitus handicap inventory (THI) score. Patients were treated with gingko biloba, gabapentin, or tinnitus-retraining therapy (TRT) for a period of 6 weeks following which above investigations were repeated. 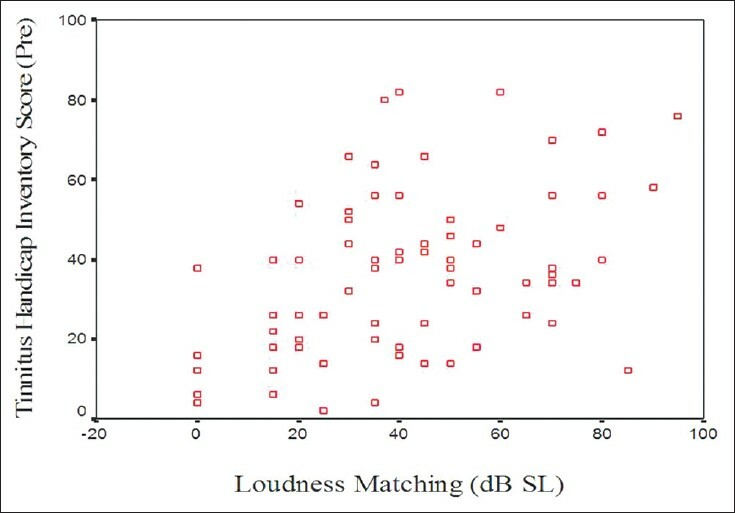 Results: The study showed a positive correlation between tinnitus loudness matches and frequency of maximum hearing threshold (r = 0.687, P = 0.001) and a significant relation between tinnitus loudness matching and THI score (r = 0.383, P = 0.001). However, no correlations were observed between pitch match frequency and THI scores. Gingko biloba and TRT were found to be effective in the management of tinnitus (P < 0.01), but no improvement was observed with gabapentin therapy (P = 0.051). Conclusion: Tinnitus loudness matches near the threshold of frequency of maximum hearing loss, thus indicating that as threshold of hearing increases, the perception of tinnitus loudness increases. However, pitch match frequency does not affect severity of tinnitus. Gingko biloba and TRT are useful in the treatment of tinnitus. Aims: The aim of the present study was to find out the hearing improvement in different types of tympanoplasties. Settings and Design: Prospective, hospital-based. Subjects and Methods : A total of 50 patients were included who were 12 years old and above, of both sexes with conductive hearing loss due chronic otitis media with or without perforation. Results: The ratio of males (28) was more as compared with females (22). Maximum number of patients belonged to the age group of 10-20 years (34%), followed by 20-30 years (30%), whereas least number of cases was found in the age group of > 50 years. Hearing loss and otorrhea were present in majority of the cases (100% and 72%, respectively). A total of 18 of the cases had cholesteatomatous chronic suppurative otitis media, while 32 ears were observed to be noncholesteatomatous chronic suppurative otitis media. The average preoperative air conduction (AC) in the present study was found to be 46.6 dB ranging from 20 dB to 112.5 dB, while the average postoperative AC was found to be 39 dB with an average gain of 7.6 dB. 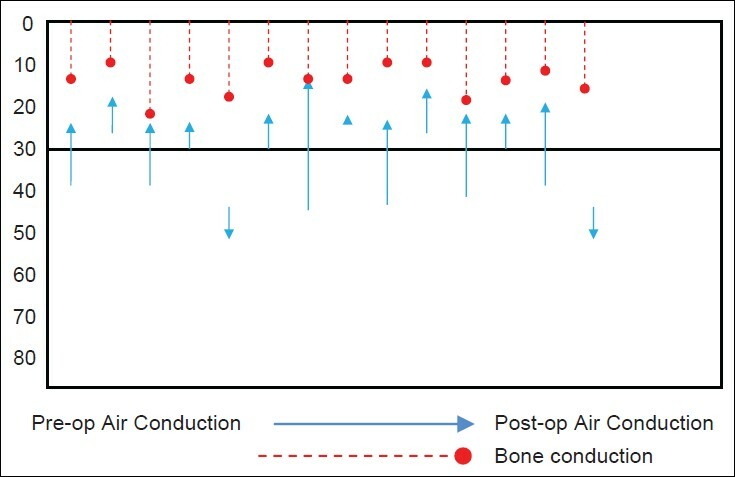 The four frequency average preoperative and postoperative air-bone gap (ABG) were found to be 26.48 dB and 20.17 dB respectively, with the average gain of 6.3 dB. The average ABG closure within 0-30 dB was seen in 33 (82%) of the cases. Social hearing was achieved in 86% of the cases in type I, 46% in type II, and 40% in type III tympanoplasty. 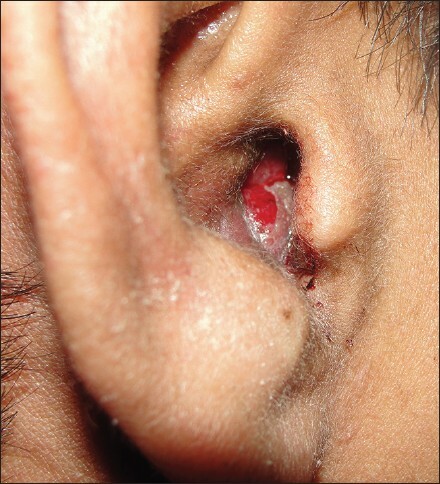 Conclusions: Tympanoplasty as a procedure when indicated without compromising for the disease, can be effectively used to improve hearing in chronic suppurative otitis media, and other types of conductive hearing losses. Langerhans cell histiocytosis (LCH) is a rare proliferative disorder in which Langerhans's cells accumulate in a variety of organs. LCH affects mostly children and adolescents, involves one or many body systems or tissues such as bone, lung, hypothalamus, posterior pituitary gland, skin, lymph node, liver, and various soft tissues. The clinical features of LCH depend on the extent of involvement. 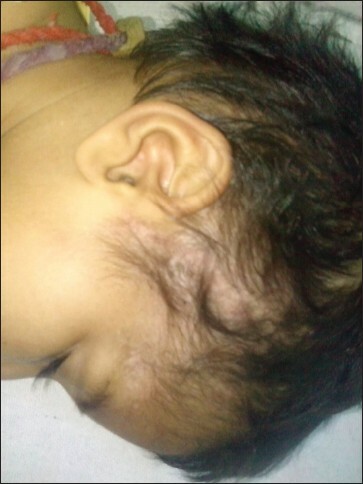 Here in, we report a case of 2-year-old girl presented with fever, swelling in front and behind of right ear and ear discharge. 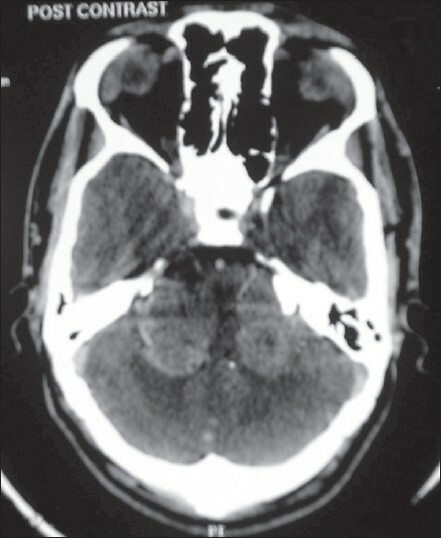 She had anaemia and lytic lesions on skull x-ray and high resolution computed tomography. Biopsy was performed and histopathology and immunohistochemistry findings suggested diagnosis of LCH. Squamous cell carcinoma (SCC) of temporal bone has been traditionally considered as the rare disease of elderly with a prolonged history of otorrhoea with a reported incidence of about 2-4 cases per million per year. The same disease in young individuals is very rare. We present a case of SCC of temporal bone in young male of Indian origin with short history of otalgia and very short history of otorrhoea without any history facial palsy. This gives us an insight about the aetiopathogenesis of SCC of temporal bone from prolonged otitis media and radiation exposure to genetic factors as for any other SCC of head and neck. Before presenting to authors this patient visited otorhinologist several times for otalgia and possibly due to short history and young age he was not subjected to any radiological investigations or biopsy and was treated symptomatically as otitis externa. This is a rare case of inflammatory pseudotumor in the mastoid area. 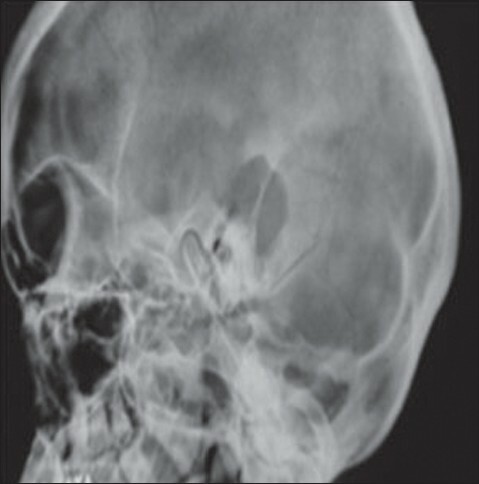 A young female presented with left-sided dull otalgia with hearing loss. 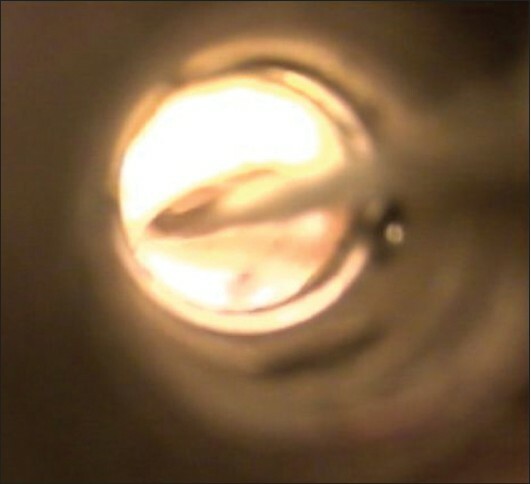 Otoscopy revealed normal tympanic membrane with left-sided sensori-neural hearing loss. Imaging showed a mildly enhancing lytic region in the left mastoid. Canal-wall-down mastoidectomy done and the granular tissue from the mastoid was sent for the histopathological examination (HPE). The HPE report was suggestive of inflammatory pseudotumor. No recurrence of the disease was noticed in the 3 years follow-up period. Cochlear implantation (CI) is a new treatment for profound sensori-neural hearing loss. Children with syndromes and conditions resulting disabilities are now not routinely precluded for receiving CI. We present an 8-month-old girl with a brain migrational anomaly and profound hearing loss who underwent CI. Neurofibromatosis type 2 (NF2) is a genetically inherited disorder characterized by the presence of multiple central nervous system tumors most characteristic being vestibular schwannomas with or without peripheral manifestations in the form of cataract or cutaneous neurofibromas. Unlike its type 1 counterpart NF2 is an uncommon disorder. We here describe a classical case of neurofibromatosis type 2 with florid clinical manifestations and characteristic neuroimaging features. We also briefly describe the literature pertaining to this rare disorder. The case also emphasizes the fact that NF2 should be considered in the list of differentials for sensorineural deafness especially when it is bilateral. 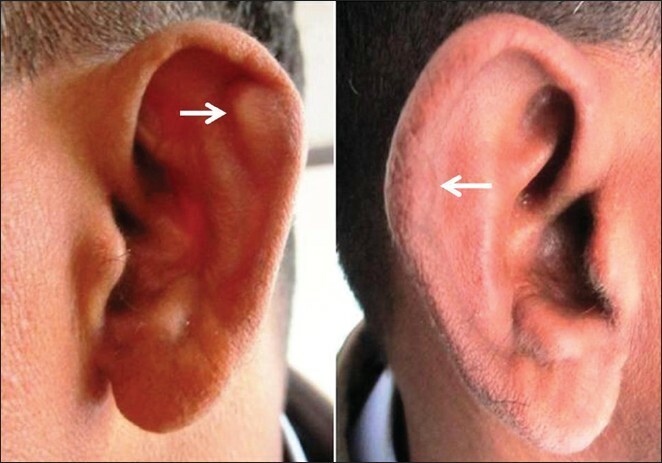 Auricular pseudocyst or Idiopathic cystic chondromalacia is a rare, benign condition characterized by a focal noninflammatory cystic swelling on the pinna, occurring usually in young male patients. Bilaterality and recurrence have been reported rarely. We report a case of bilateral, recurrent auricular pseudocyst in a young male patient, where fine needle aspiration cytology coupled with fluid lactate dehydrogenase level estimation was diagnostic. Repeated surgery was avoided and conservative treatment was proved to be effective.